Join the fun, fast-growing sport of Pedal Pulling. Pedal Pulling is great family entertainment, teaches sportsmanship and is just good clean fun. Kids ages 4 through 11 compete against kids from their own age group. 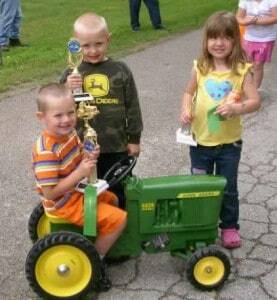 This pull is state sanctioned to qualify the top two in each age group to participate in the State Pedal Tractor Pull held the second Saturday in September–location to be announced. Each child will receive a participation ribbon for their efforts in the pedal pull. From there, the top boys and the top two girls in each group can compete in the National Pedal Tractor Pull head in Mitchell, South Dakota at the end of September. The event will take place at Second and Center Streets, Winona. The Kid Pedal Pull is a FREE Steamboat Days event sponsored by Kwik Trip Stores of Winona.